Matters of wills and probate are overseen by the Surrogate’s Court in New Jersey. You can write your own will, but this might be costly to your beneficiaries if you make mistakes or fail to keep up with the state's frequently changing laws. If you write your will yourself, it may be best to have an attorney review it to make sure it adequately meets your needs. You must be 18 years of age or older and of sound mind to make a will in New Jersey. It must be signed by two witnesses. There is no law against the witnesses also being beneficiaries. Holographic, or handwritten, wills are accepted as long as it can be proved that the signature and all the important provisions are in your penmanship. However, holographic wills are probated through the Superior Court in New Jersey, not the Surrogate's Court, and this can be a more costly process for your estate and heirs. You can revoke your will by physically destroying it or by making a new will that revokes it. Any provisions relating to your spouse, whether they are bequests or your wish for him to be the executor of your estate, are nullified if you divorce him. However, the provisions are reinstated if you remarry him. New Jersey taxes assets you leave to your beneficiaries, depending on your relationship with them. “Class A” beneficiaries include your spouse, civil union or domestic partner, parents, grandparents, children, stepchildren and grandchildren. They are exempt from inheritance taxes. However, your siblings, in-laws and friends will have to pay up to 16 percent of the value of whatever you leave them in your will. If you make a gift to one of them in anticipation of your death and die within three years of doing it, New Jersey will count that gift as part of your willed estate and tax it. If you die without a will, or intestate, your spouse inherits your estate only if you don’t have any children from another relationship and your parents are not living. New Jersey recognizes domestic partners as having the same rights as spouses for purposes of estate law. In New York, matters of wills and probate are handled by the Surrogate’s Court in the county where the deceased primarily lived. Like all states, New York's legislation builds in safeguards for spouses. The state also accepts handwritten and oral wills in an effort to accommodate members of the military. A will sets down your wishes for the division of your assets among your heirs after your death. Although a will can be drawn up without the help of an attorney, depending on your family situation and the size of your estate, it may be a good idea to consult an attorney and an accountant experienced in estate and tax matters, before doing so. A valid and comprehensive will may spare your family considerable trouble in the future. Who Inherits if There's No Will in Connecticut? 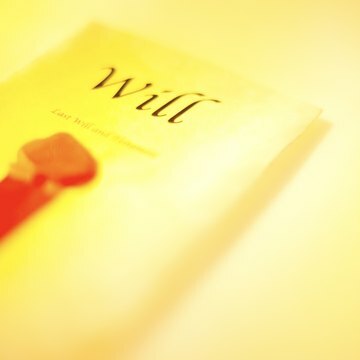 What Are My Rights if My Parents Died & My Brother Is the Executor of the Will?